energyOrbit Marketplace is the first-of-its-kind large scale C&I trade ally and residential consumer-friendly self service “shopping” portal. energyOrbit Marketplace streamlines customer and trade ally program participation through an intuitive e-commerce shopping experience. Improve customer engagement, eliminate paperwork and accelerate rebate fulfillment. The state-of-the-art e-commerce platform makes it easy for trade allies/contractors to gain deeper and more accurate insight into their program project pipeline. Utility customers are empowered to more easily find and participate in energy efficiency programs offered by multiple providers in one user interface, regardless of service territory or fuel type. 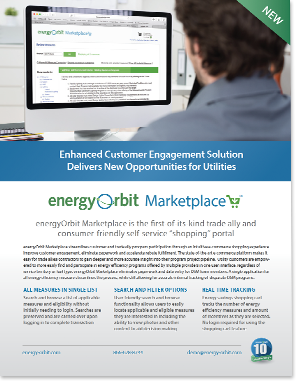 energyOrbit Marketplace eliminates paperwork and data entry for DSM team members. A single application for all energy efficiency measure streamlines the process, while still allowing for accurate internal tracking of disparate DSM programs.